The proprietary residential roofing systems available from Roofman for homeowners in and around Saline, Michigan, provide exceptional resistance against the elements. We offer durable asphalt shingles and SBS rubber shingles options for our roofs so that they will be able to handle whatever Mother Nature throws at them. SBS rubber shingles are especially tough, as they have the industry’s highest impact rating for protection against heavy rainfall, hail, and windblown debris. They also have a Scotchgard™ protector to prevent ugly black streaks caused by algae growth, and they can withstand wind speeds of up to 130 mph. A top traction layer – This layer doesn’t let any debris through. A rubberized middle layer – Many other contractors just use tar paper, but we use a rubberized membrane in the middle that helps keep our residential roofing system watertight. A bottom water layer – The bottom layer provides the toughest line of defense against water infiltration. Because our proprietary underlayment is so watertight, it could prevent water damage for two years, even if no shingles were installed. What’s more, you can choose from a variety of beautiful shingle colors, which will allow you to choose a roof color that suits your aesthetic preferences and matches your Saline, MI, area home’s color scheme. Once you’ve selected your residential roofing system and we’ve inspected your current roof, we’ll begin the installation process. Our expert installers have nearly 30 years of installation experience and can install a roof in a single day. We’ll also be available to service your residential roofing system afterwards as we provide a transferable lifetime labor and material warranty. 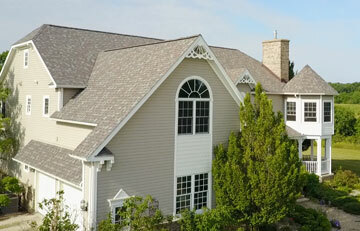 Contact us today to schedule an inspection of the existing roof on your residence in the Saline, MI, area. We’ll be happy to provide you with a guaranteed estimate for one of our residential roofing systems.